The Genie has traveled from sea-to-sea, granting wishes to all of those who have come in contact with him. In his travels the Genie has noticed one troubling thing - Nobody can recommend a good meal on the road. Where’s the nearest place to grab a slice of pizza? Who has the best General Tso’s Chicken in the area? Most importantly, who delivers to the magic lamp? Hence, the quest to create menugenie.com began. one-stop marketplace for all of your favorite local restaurants. 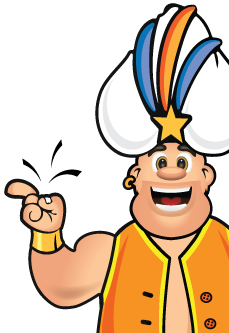 The Genie knows how hard it is to place orders over the phone sometimes, whether it’s because you’re unfamiliar with the menu, you have a very large order, communication barriers, or you simply don’t know what you want. The Genie will help you find a restaurant, and find the dish that you wish with a smooth, secure transaction. The prices that you see on our website are exactly the same as the ones you would see in the restaurant. Menu Genie does not add any fees to the process, and we do not allow our partners to charge different prices than the ones they have in their restaurants. The Genie will walk you through the ordering process, from appetizers and side dishes, to drinks and dessert. You can add, edit, and delete items as you go, without the hassle of a busy phone line or being put on hold. Checkout is easy, safe, and secure.